Looking for something to do this weekend? We've teamed up with Dublin Gazette to bring you the best events on in the city over the coming days. Ireland’s Festival of Nations is a free multicultural festival. The festival features a host of events, including a Flags Parade, Music, Face-Painting, the Friendship World Cup, “Your Rights Are Working in Stone” Workshop, and much more. Bring along the whole family for a day out that they won't forget in a hurry. 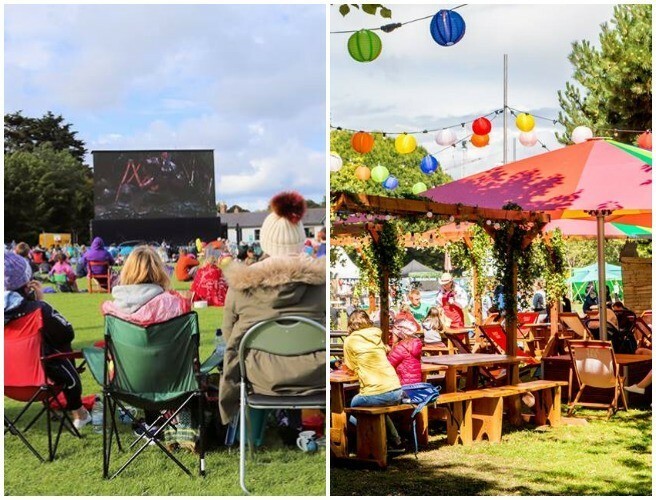 The lawn at the back of Marlay Park House will be transformed into a movie theatre of dreams, adventure and wonder for the weekend with some classics, recent hits and family favourites this weekend. All screenings will be free of charge and shown on a high definition screen, which is half the size of an average house. Why not bring a picnic and blankets to have all the comforts of home in Dún Laoghaire-Rathdown's outdoor home cinema for the weekend. Movie treats will also be available for purchase throughout the event. Swim in the Irish Sea, cycle through the Wicklow Mountains National Park and sprint to the finish in historic Dun Laoghaire. The race features a 1.2-mile (1.9KM) swim from Sandycove, home to the famous Martello Tower, in the clear waters of the Irish Sea in Dublin Bay, before taking athletes on a spectacular and challenging 56-mile (90KM) bike course. The course travels through some of the most scenic areas in the region, including County Wicklow, home to the Wicklow Mountains National Park and its glacial lakes, rivers and abundant natural beauty. Athletes will take in stunning coastal views and weave their way through the streets of the charming seaside town for the 13.1-mile (21.1KM) run, before finishing with Dun Laoghaire Harbour and Dublin Bay as the backdrop. Europe's largest BBQ & Craft Beer festival returns to Herbert Park. A celebration of the art of cooking with fire andsmoke, in the leafy surrounds of Dublin 4's Herbert Park. The Big Grill will allow you to smell, taste, discover and learn about all kinds of BBQ'ing grilling, smoking, meats and delicacies from around the globe, all washed down with a choice craft beer or cider. There will be demos and workshops from well-known chefs, a chilli eating challenge, children's play area with entertainment, a grand BBQ cook-off and loads more. The Dublin Tattoo Convention offers people the chance to meet and hang out with thousands of like-minded souls who have a passion for tattoos. There are, booths with products and services, competitions and contests, giveaways, seminars and workshops related to tattoo industry issues, along with food, drink and entertainment. You can also get tattooed and pierced at the convention. If anything, it is one of the best places because you have an opportunity to get tattooed by artists of note who might otherwise be out of reach due to geographical distance or availability. Even if you are not sure if you want a tattoo, going to the convention will help you become more comfortable with the process as you can watch tattoos being done and talk to the artists. National Heritage Week begins on Saturday with a week-long programme of events – many of them free – across the city. National Heritage Week is part of European Heritage Days. These are a joint initiative of the Council of Europe and the European Union in which over forty countries participate each year. The main aim of European Heritage Days are to promote awareness of our built, natural and cultural heritage and to promote Europe’s common cultural heritage. Every year millions of Europeans visit historical monuments and sites throughout Europe on European Heritage Days. See heritageweek.ie for a full list of events.